Home » Uncategorized » Vive Quentin Roosevelt! 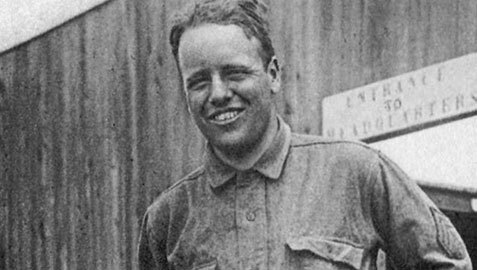 This news may shock you: Quentin Roosevelt is still alive. Not in the corporal sense, of course, but as a strong spiritual life-force, especially in France where he died in aerial combat during World War I. Theodore Roosevelt’s youngest son was piloting an open-cockpit Nieuport bi-plane for the U.S. Army Air Service when a German fighter pilot gunned him down on July 14, 1918 during an intense dogfight over the hamlet of Chaméry, about a hundred miles northeast of Paris. As the centennial of the Great War’s beginning approaches in August 2014, public fascination with this period seems endless. Witness the popularity of PBS-TV’s Downton Abbey and the rash of books being published about the war. My own, with the working title of Quentin and Flora, will be released next year. My wife, Jane, and I recently returned from a sentimental journey to France to gather research and color for the book. Our trip took us not only to Paris—in part to find Eleanor Alexander Roosevelt’s wartime family hostel—but also to Normandy and the Western Front. 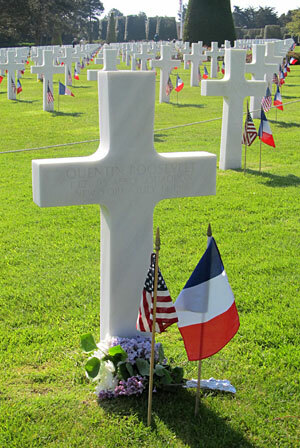 Quentin, we know, is buried alongside his brother Ted at the American cemetery at Colleville-sur-Mer in Normandy, the only World War I veteran to be so honored. I placed a spray of freshly-cut lilacs at the base of his stone. It stands at the end of a row of grave markers, about 150 feet from a low retaining wall that looks down on Omaha Beach. 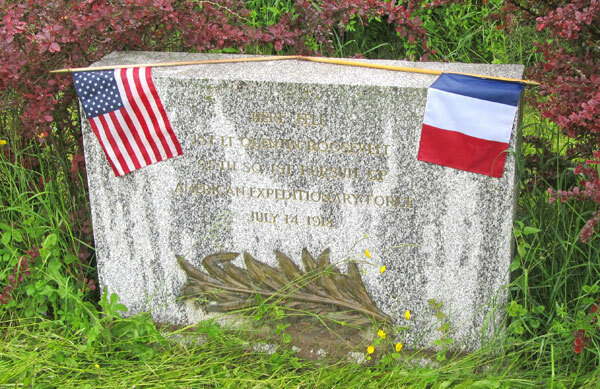 The memorial fountain that Edith Kermit Roosevelt had built in the early 1920s to honor her son’s service remains a compelling attraction to residents of Chaméry and visitors alike, as does a dark granite marker in a nearby farmer’s field. It memorializes the place where Quentin’s plane went down and where he rested for decades before being reinterred in Normandy. But the real surprise of our journey came in the tiny villages of Saints, Touquin and Mauperthuis, about 35 miles southeast from Paris. That was where Quentin was billeted during his days at the front and where the airfields used by his 95th Aero Squadron once were. There, prominent villagers still respectfully recall Quentin’s sacrifice and speak of him with hushed reverence. Memorials to him and his Army Air Service colleagues seem to be everywhere, or venues where memorials once stood. There’s even talk of a new one to honor Quentin in time for the centennial of his death. Much of the credit for keeping Quentin’s torch burning belongs to a band of faithful admirers in the U.S. and France for whom the Roosevelt name still brings admiring remembrances. 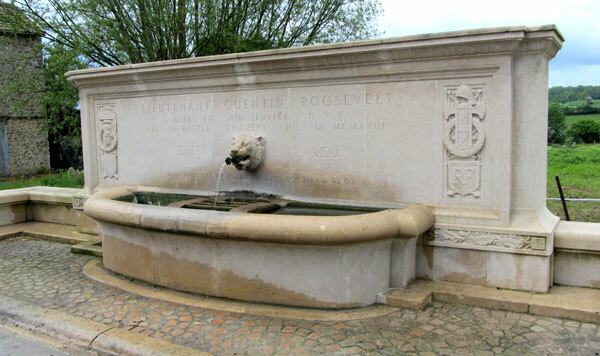 In the town of Chateau-Thierry, northeast of Paris, there’s even a vineyard that bottles Quentin Roosevelt Champagne. We brought home a bottle to pop open on the day Quentin and Flora makes the best-seller list! Quentin’s bravery and courage live on in the minds and hearts of the grandchildren and great grandchildren of many French people he fought to save nearly a hundred years ago. That is his eternal legacy. A TRA member active in our New England Chapter, Chip Bishop is the author of The Lion and the Journalist – the Unlikely Friendship of Theodore Roosevelt and Joseph Bucklin Bishop, published by Lyons Press in 2011. Having just returned from Europe and visiting Normandy for the first time i have questions about the remains of Q.R. and T.R. JR. When was Q moved into the grave at Normandy? When was T.R. JR. interred there? Why is there such a large space marked off by their graves? It was a deeply-moving experience seeing that cemetery where our fallen service troops lay. How they could win that battle on the shores of France is truly a great story. Thanks. Ted was buried in the American Cemetery on Bastille Day, 1944 soon after his death in France from a heart condition. Thanks to the intervention of Ted’s widow, Eleanor, Quentin was moved next to Ted on September 23, 1955. For 37 years previously, he had lain in Chamery, France where his plane fell during World War I combat. The area around their graves has recently been resodded because of all the visitor foot traffic.